For a third straight game, the Dallas Stars started slowly and it cost them dearly. However, unlike their 3-2 comeback win over the Buffalo Sabres on Monday night at American Airlines Center, the Stars weren’t able to overcome spotting the Columbus Blue Jackets a 3-0 lead in the opening period and fell in the Ohio state capital, 4-2. Columbus struck early when Boone Jenner gave the home team a 1-0 lead with a wrister that beat Dallas backup goaltender Dan Ellis on his glove side on the Jackets’ first shot of the game at 1:14 of the opening period. R.J. Umberger then made it 2-0 just over 10 minutes later when he got the better of Ellis on his blocker side. A power-play goal by Artem Anisimov with exactly five minutes left before the first intermission, the first of two goals Anisimov would score in the victory, made it 3-0 heading into the first break. To their credit, the Stars hit the ice looking to atone for their first-period sins in the second, but had nothing to show for their efforts and still trailed by three after 40 minutes. Dallas responded for a pair in the third when Alex Goligoski scored a power-play goal, his second goal in as many nights, off a rebound and Trevor Daley added one just a few minutes after "Goose" found the back of the canvas. However, the Stars were unable to find the game-tying goal and when Anisimov beat Ellis with a backhand with 4:07 remaining a goal which came after he skated around from behind the Dallas goal, the loss was complete. "Yeah, it was tough to track the puck and to get a feel for the flow of the game," Ellis said of his performance in the loss. "When you have that much time off, it’s tough to replicate anything like that in practice and I think things came a lot quicker than you would anticipate and I didn’t make the saves I needed to." Dallas also spotted Tampa Bay a 2-0 lead on Saturday afternoon at the AAC and ended up losing 4-2 to the Lightning. On Monday, Buffalo scored first, but the Stars were able to come back and prevail to hand head coach Lindy Ruff his 600th career victory as an NHL head coach. 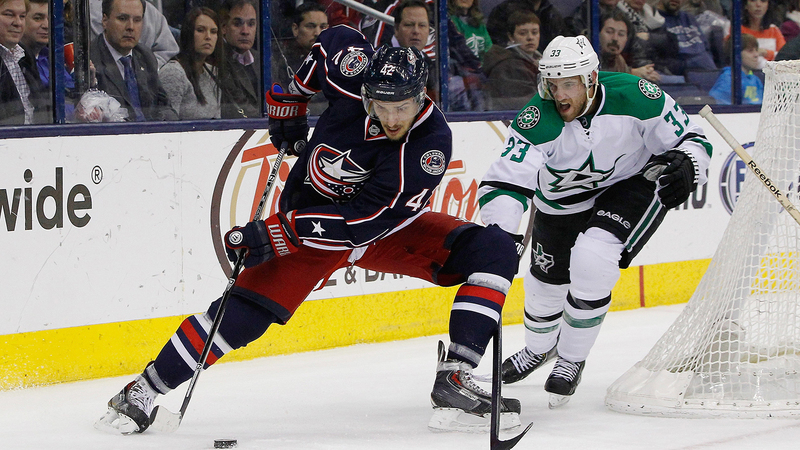 But Dallas captain Jamie Benn knows that if the Stars are to end their five-year playoff drought, that slow starts like they had Tuesday night in the second night of a back-to-back in Columbus can’t happen much more if at all the rest of the way. "That’s not the start we want in any game, especially this time of the year when every game’s going to be tight. There’s not going to be too many blowouts from now on, so you’ve got to come out with a strong start and be ready to go every game here," Benn said. Ruff definitely liked the battle level his club showed and the heart they continue to display when facing adversity like trailing by three goals after one period. However, he echoes his captain in saying that slow starts need to quickly become the exception rather than the norm if the Stars are to achieve their ultimate goal and reach the postseason. "At 3-0, I thought we got on our toes and put a lot of pressure on. I think the only shot they got in the second was late and I think that’s what you got to ask your team," Ruff said. "Sometimes you’re going to get hit with some adversity. We had things going pretty good, we got hit with a little tonight. I thought we were knocking on the door. We had a couple good opportunities, but we probably needed a big save here or there, unfortunately it wasn’t Dan’s night." Dallas returns home to begin a three-game homestand, a run on home ice which starts Thursday against the Vancouver Canucks.